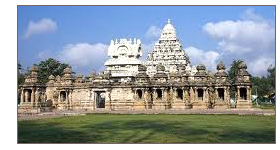 Kanchipuram Monastery served as the largest Buddhist center in Tamil Nadu during 2nd century CE. The earliest reference records present this revered city as a site of stupa and a monastery till 7th century. Xuanzang (Hiuen Tsang) travel accounts reveal the presence of hundreds of monasteries and 10,000 monks associated with the Sthavira School of Mahayana in Kanchipuram. Present day Nagapattinam in Tamil Nadu had a monastic complex, Chudamani Vihara, constructed in 1006 CE. This monastery enjoyed the patronage of Chola king. Since 1856, about 350 bronze Buddha have been excavated at Nagapattinam, belonging to the period of 11-16 century. Uraiyur was an active Buddhist center during the advent of Buddhism in south. The Pandyan capital of Madurai was a center of Buddhist monastery built by Emperor Ashoka.